Henry weighs ____ we will find out at his appointment next Monday! I'm guessing 19lbs. His rolls are multiplying! HE ROLLED OVER. Life will never be the same. He is slowly enjoying a variety of food. Any new texture takes some getting used to, but so far he's a fan of butternut squash, bananas, pears, oatmeal quinoa, and avocados. Green beans are still iffy. He traveled a ton over Christmas: Connecticut and Pennsylvania! He was great for the first half, but lost it in the last leg of the trip. I think 2-3 hours is his car limit. Noted, Henjo. Sleep. OH the sleep. Henry is finally back to sleeping through the night, going to sleep around 7:30-8pm and waking around 6-7am. While traveling he would wake up and need his pacifier or come into bed with us. The unfamiliar environments didn't suit him at 4am. We've gone down to two naps which has been interesting. His last nap was rapidly dwindling; it would take me twenty to thirty minutes to get him down and time would only allow for a twenty to thirty minute nap before he would need his last feed before his bedtime feed. Going down to two naps has been interesting, but he seems to be getting the hang of it. He has started lifting his arms to be picked up. If I offer to pick him up, I wait for him to lift his arms. It's the sweetest. His favorite activity is eating his feet. If he has socks on, he pulls and eats those until they're off. I've started taking them off because I run out of dry socks for him!!! He finally loves his exersaucer. He's an animal in it, bouncing and laughing. Henry is sick for the first time. Oh what a difference a day makes. These pictures were taken yesterday, and today he woke up miserable with a low fever and congestion. Poor baby. This month will be exciting. First of all, the PACKERS are in the playoffs, so Henry will be cheering loud and proud. We're also going to Puerto Rico next week, so his first "international" trip is coming up! We pray that he is fully well by then. We can't wait to introduce him to the ocean, get sand in every chunky monkey crevice of his body, and watch the sunset with him. He is truly a joy to us and everyone he encounters, and we are so thankful to be his parents. 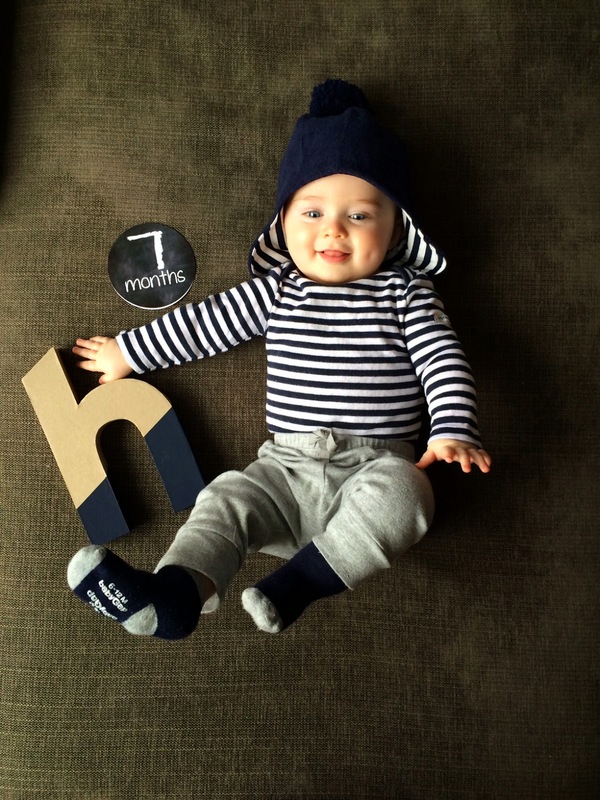 Happy 7 Months Little Lion Man! Those baby blues are intense. Feel free to check out my posts on the Smart Mom Blog!